Copenhagen-based company Donkey Republic has announced its intention to grow its blossoming empire into a more global platform. The startup, which launched in mid-2015, aims to use an 11.1 million kroner investment from the Danish Growth Fund and the Luxembourg-based venture capital fund Howzat to more than triple the number of its bicycles by the end of the year. ”The need for affordable and sustainable mobility in cities is growing exponentially, and bikes are an obvious solution,” said Erdem Ovacik, the CEO of Donkey Republic. Donkey Republic’s aim is to foster more sustainable and less congested cities by offering a bike-share/renting platform that permits bike owners to rent out their bicycles via the Airbnb-like service. 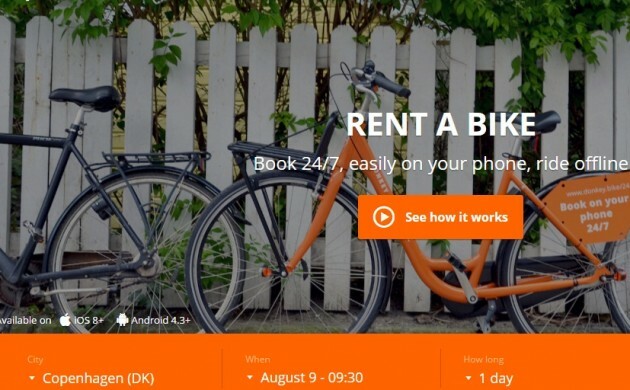 Currently, there are about 300 bikes that can rented through Donkey Republic’s platform in Denmark across over 40 hubs. Other hubs also exist in Sweden, the USA, the UK, Spain, New Zealand and Finland, and the company hopes to reach a couple of thousand bikes by the end of 2016. As of now, about 85 bikes are booked globally via www.donkey.bike on a daily basis. Bike owners purchase Donkey Republic locks that they mount on the bikes and which can then be located and unlocked by customers using the Donkey Republic app. Donkey Republic. Building a global map of ready-to-share bikes from Donkey Republic on Vimeo.